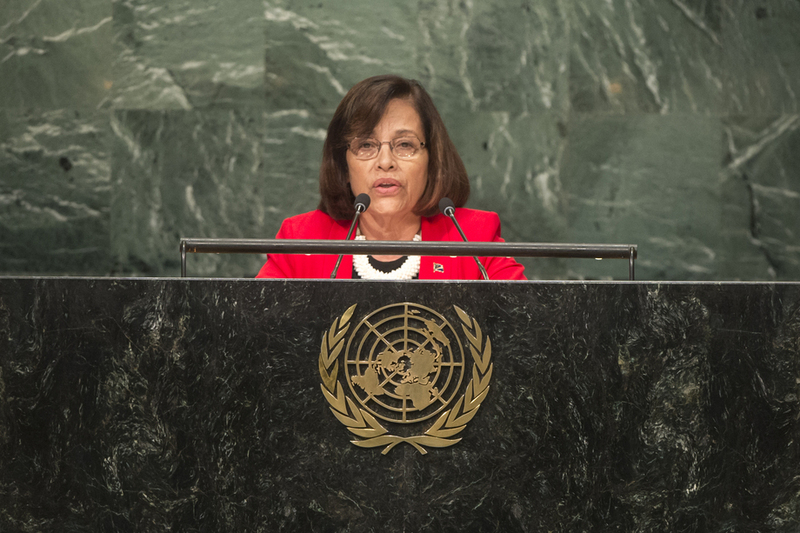 HILDA C. HEINE, President of the Marshall Islands, said she wished to share her country’s story of how it — a small island and large ocean nation — was defining its future. First, progress must be built on education to ensure young people had tools to lead the future. The Islands must continue to improve teacher qualifications and design a curriculum emphasizing the Marshallese language and culture. A new research partnership with Columbia University Teachers College would assist with bilingual education and inspire the country to serve as a model for others worldwide. The future must also be underpinned by economic security, as the Islands had too long been reliant on outside assistance, she said. While that had provided a vital backstop for basic social development, it had also undermined the country’s self-confidence. It faced serious challenges as a small island State, but had unexplored potential to grow. The country must expand the private sector, create jobs and increase its gain from sustainable resources, especially fisheries, ports, tourism and copra. National growth and well-being must be driven by a commitment to improve delivery on basic social development, focusing on health, food security and the environment, she said. Improved delivery should especially target the most vulnerable groups in the Islands, including the elderly, disabled and single parents. The country had the highest rate of diabetes in the world. Its consumption of sugary food and beverages was literally killing the people. The environment was challenged by the overwhelming amount of plastic, metal cans, and trappings of the modern western world. Even with its very survival on the line, the Islands were committed to addressing those challenges with immediate action, she said. To counter diabetes, the Parliament was considering a sharp increase of import taxes on sugar-added beverages. It was also implementing, with international support, a disaster risk reduction plan and measures. Parliament was considering a national ban on plastic bags and implementing recycling to clean local communities and provide a modest stream of income. The country was also taking practical measures to reduce its costly reliance on oil through sustainable transport and more efficient and renewable energy.